When we first bought our house, it looked okay from the outside, but it was boring. It had been stripped of all its Folk Victorian trim and lacked much curb appeal. It still has plain white vinyl siding, but we've painted the trim, fixed up the yard and added some gingerbread fans. We have been planning on eventually adding a window to our front gable along with shingles and now the money is all saved up and I've been harrassing a Pella salesman to price just about very imaginable grid pattern and window shape. Seeing as how we are not Bill Gates and we have a very definite budget limit to this particular Moron Project, which is compelling us to put the nicest window in our house on the attic, we still had to turn away from the lancet arched window (which would have alone cost more than our entire budget for windows, trim, shingles and installation), the gothic grid pattern and a few other things that really called to me. Yesterday while the kids were napping, I played with our pictures again and finally everything started coming together in my mind and in the pictures. The timing for things coming together worked well, because we had an appointment last night to order the window. The nice thing about having a Folk Victorian is that they grabbed a bit of style from any place they could find it. 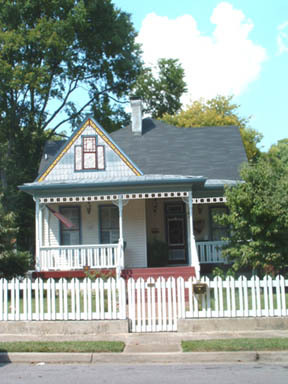 While we want a house that doesn't look crazy and remuddled, we have a little leeway in picking and choosing from Carpenter Gothic, Queen Anne, Stick and other true Victorian styles. So here's what I envision our house looking like eventually with windows in the gable, octagonal shingles on the gable, bargeboard gable trim and for added measure the spandrels I hope will be some other year's big Moron Project. That's lovely, Jordana! I need to go through Nashville again sometime soon on my way to KY, to check it out. I like your house a lot, and the inside is great too. Very cute! And commendable of y'all to store up your moron project budget before proceeding. Our house has no discernable style. It's either straight vernacular, or possibly colonial revival. Of course, we don't have any money in the budget for aesthetics anyway, so it's a moot point!